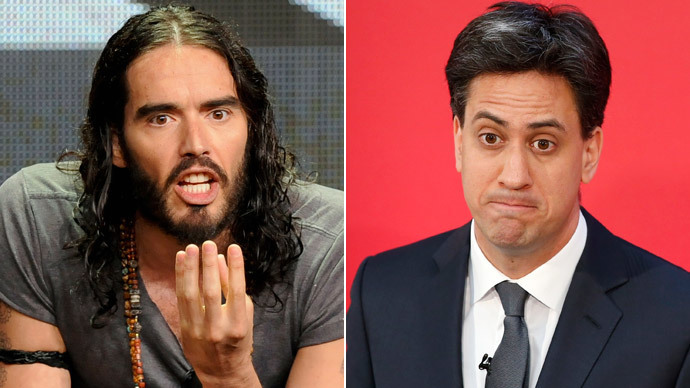 Labour leader Ed Miliband was seen leaving Russell Brand’s house late on Monday night amid speculation the comedian and activist may come out in favor of the party in the final week of the general election campaign. A Labour spokesperson confirmed Miliband was present at the comedian’s house to film an interview, adding that Labour is excited for the broadcast. If Brand uses the video to come out in support of Labour, it will mark an abrupt change in his attitude towards Westminster politics. The comedian has previously urged young people not to vote, suggesting they become activists for a cause rather than supporting “broken” political parties. Miliband has previously objected to Brand’s ideology, saying he wanted young people to be involved in the general election. “I definitely want people to vote – and I want people to vote Labour, obviously – but it’s really important that we engage people in the election. “People criticize Russell Brand, and I don’t agree with his message, but what he’s saying, a number of people are thinking, which is that politics doesn’t feel like it speaks to them,” he said. While critics argue his ideas could be damaging to the electorate, Brand has garnered the support of 9.5 million followers on Twitter and a mass audience for his YouTube program The Trews. Brand’s self-styled ‘revolution’ would involve a radical overhaul of the current political system, whereby tax evaders and corrupt establishment officials would be held to account. If Brand does come out in favor of Labour, he will be the second celebrity to do so in as many days. On Monday, internationally renowned physicist Stephen Hawking confirmed he would be voting Labour, and publicly backed the party’s Cambridge candidate Daniel Zeichner. “I think he fully appreciates the huge investment that the last Labour government made in science and you can see that in a lot of the buildings and laboratories around Cambridge. The scientist, who was recently the subject of the Oscar winning biopic ‘The Theory of Everything,’ is a well-known socialist. He has turned down the offer of a knighthood to keep in line with his views.